I found my earliest Sabine's Gull to date at Warren Dunes SP in Berrien County Michigan yesterday. The bird was bolting north with a small flock of Bonaparte's some 300-400 yards off shore. I watched it for as long as I could before running to my car and driving to the next public beach. I didn't have high hopes for relocating it, but 30-40 minutes later, I spotted what looked like the same flock of Bonparte's feeding on the lake off Weko Beach. Amazingly, the Sabine's was sitting on the water feeding and bathing like a phalarope. I watched it in my scope for a few minutes before bumbing into Michigan birder Matthew Sepcott. Much to his pleasure, he got himself a state bird and only his second Sabine's ever. Juvenile Sabine's Gull. Berrien County, Michigan. 27 August 2013. 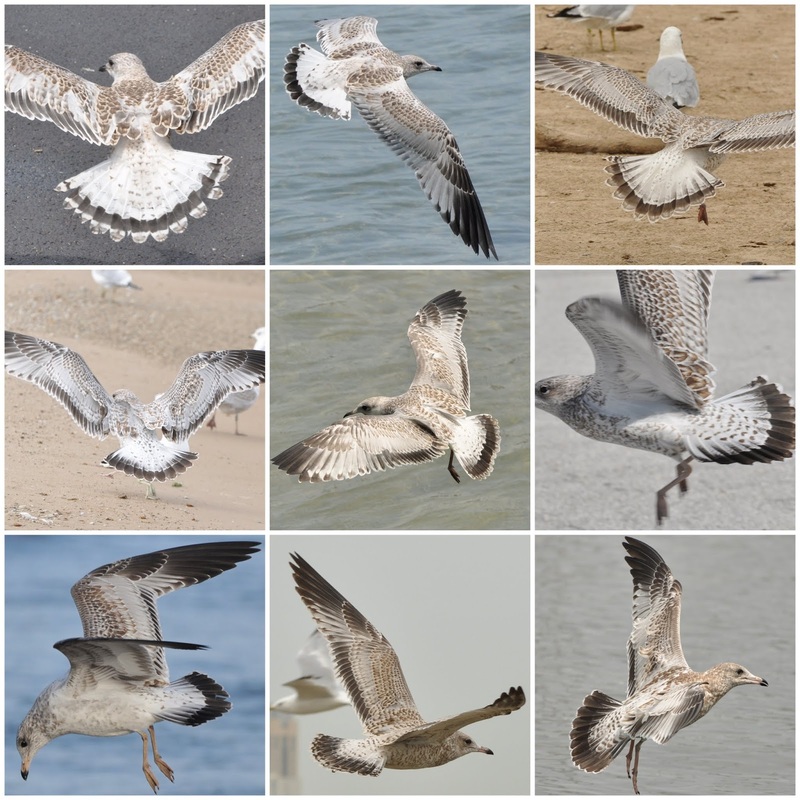 Ring-billed Gulls show various tail band widths in their first cycle - some thin, others wide. Here's a collection of examples beginning with narrow bands and leading up to wider bands. Juvenile Ring-billed Gulls. All photographed on Lake Michigan between July and August. I've found that thin tail bands usually taper off and become thinner at the outer tail feathers (see the first bird pictured above), while wide tail bands typically become distally wider (see the last bird pictured above). Here, there is a variable amount of black that creeps up the outer tail feathers and may sometimes reach the bases of these outermost rectrices. This look is much different than that of birds with thinner bands. In short, the amount of variation is appreciable and may cause confusion for those not familiar with it...spread the word!